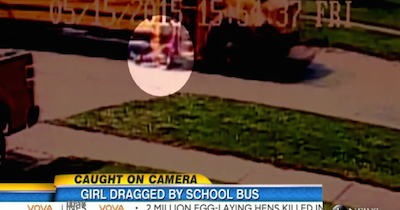 Caught On Video: Elementary School Girl Dragged By School Bus. This shocking video captured an elementary school girl in Louisville, Kentucky, getting dragged by her school bus. On Friday afternoon, a Jefferson County public school bus was letting off a young girl who is five or six years old, when “apparently her backpack got stuck in the door,” Louisville Metro Police Department spokesperson Dwight Mitchell told ABC news. “The bus driver didn’t know that,” and the girl was dragged about 100 feet, Mitchell said. Witness Esther Karschner said that she didn’t see the girl step off the bus, but saw the girls legs hanging out of the bus as it drove down the road. Karschner Also said she saw a car speed alongside the bus, honking to try to stop it. The young girl was hospitalized to be treated for road rash to her legs, Mitchell said. Her injuries were not life-threatening.